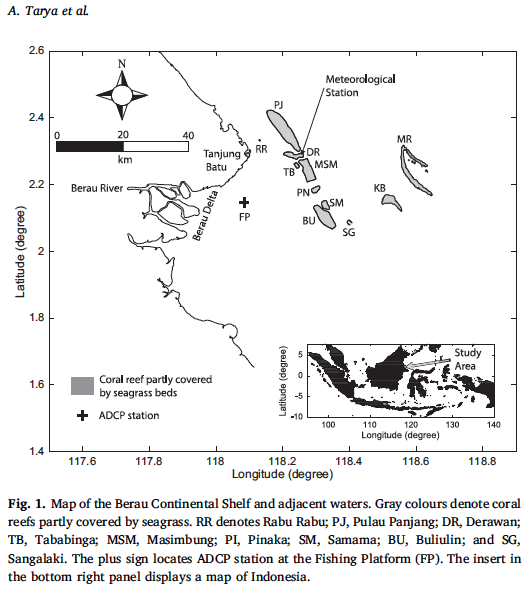 In this paper led by Ayi Tarya (Bandung Institute of Technology), Ton Hoitink (WUR) we found that measurements of low salinity can be a suitable indicator for coastal ecosystem health. The Berau Continental Shelf (BCS) in East Kalimantan, Indonesia, harbours various tropical marine ecosystems, including mangroves, seagrass meadows and coral reefs. 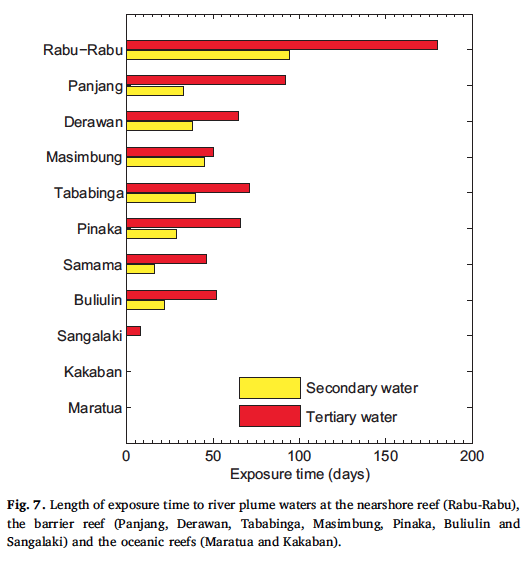 These ecosystems are located partly within reach of the Berau River plume, which may affect ecosystem health through exposure to land-derived sediments, nutrients and pollutants carried by the plume. Hydrodynamic models (Empirical Orthogonal Functions analysis) revealed that river plume dispersal patterns strongly reflect monsoon seasonality. Furthermore significant correlations were found between exposure time to low salinity (days with salinity values below 25 PSU) with coral cover, coral species richness, seagrass cover, the number of seagrass species, seagrass leaf phosphorus, nitrogen, C:N ratio and iron content. By comparing the correlation coefficients and the slopes of the regression lines, our study suggests that coral reefs are more susceptible to low salinity levels exposure than seagrass meadows. For seagrasses the nearshore region was categorized as “high risk”, the barrier reef as “medium to low risk” and oceanic reefs as “low risk”. (see figure). In Indonesia and elsewhere in world coastal ecosystems are increasingly exposed to the consequences of major changes in land use that increase nutrient loads and sediment runoff which leads to a decline in water quality. 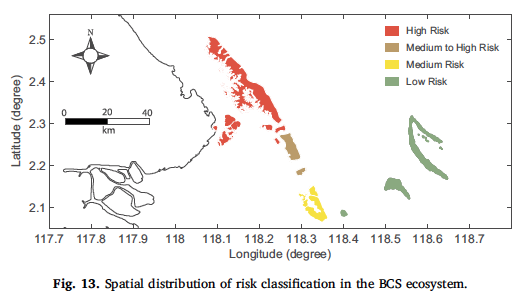 When combined hydrological models combined with biological indicators may provide useful tools to detect increased river influence and aid in the development of management measures to conserve critically important coastal ecosystems. The fieldwork was part of the East Kalimantan Programme (EKP) funded by WOTRO Science for Global Development, a division of the Netherlands Organisation of Scientific Research (NWO) under grants WT77-204 and WT87-299. 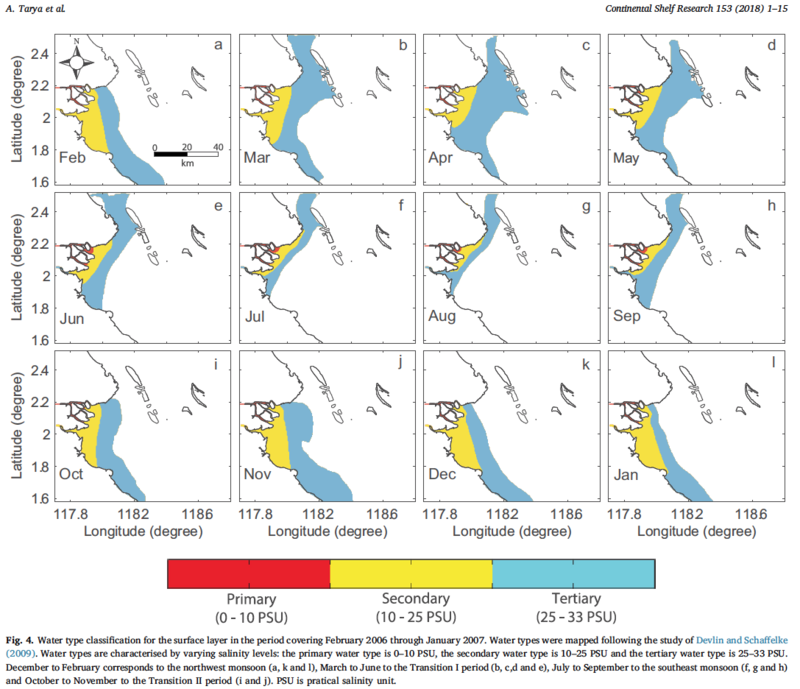 Tarya A, Hoitink AJF, Van der Vegt M, van Katwijk MM, Hoeksema B, Bouma TJ, Lamers LPM, Christianen MJA (2018) Exposure of coastal ecosystems to river plume spreading across a near-equatorial continental shelf. doi: 10.1016/j.csr.2017.12.003 Continental Shelf Science. 153;1-15.